Let's see how the whole process starts. I am making the Karanjis with filling 3 from the list above. This filling can be prepared up to 7-8 days ahead of time. Dry roast coconut, sesame seeds, poppy seeds separately until golden brown. Do NOT mix these together once they are roasted. Roast semolina with 1 tbsp ghee/oil until golden brown. Set aside separately. Roast whole wheat flour with remaining ghee/oil. Roast it until golden brown. Coarsely grind poppy seeds, sesame seeds and coconut (in that order). 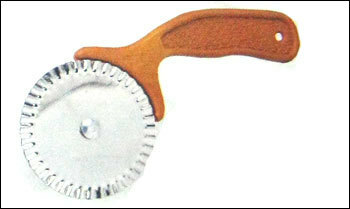 Fit 'S' shaped blade to the food processor bowl. Put everything, flour, nut powders, jaggery, cardamom-nutmeg, in the food processor. Process it for 8-10 minutes. Sieve through larger sieve to remove bigger chunks if any. Milk+Water mixed together - As needed. Heat oil in small kadhai. Mix APF, rava, sugar, salt together in a big bowl. Make a well in the mixture. Sprinkle pinch of flour in heating oil, flour should sizzle immediately. Pour oil in the oil in flour mixture. Mix thoroughly with spoon. Make stiff dough using little bit of water at a time. Cover with damp towel and set aside for at least 2 hours. After two hours pound the dough nicely for 15-20 minutes with stone mortar pestle. Divide the dough in 4 equal sized balls. Roll thin chapati and spread 1 tbsp oil evenly. Now make tight roll, and cut into 1" pieces. Continue with all the remaining dough and you should have about 40 pieces. Cover these pieces with damp cloth all the time. This will keep the dough soft. Take one small piece and roll into about 3-4" diameter puri. Hold the puri in hand, pinch on the side, and add 1-2 tbsp filling. Carefully close the karanji. Now press it on the cutting board, and carefully remove the extra dough from the side using karanji cutter. Continue with remaining balls. Cover prepared karanjis with cloth. Once all the karanjis are ready, deep fry in medium hot oil. Add salt, oil and earth balance to APF, mix just for few minutes. Using very little ice cold water at a time make dough. Do not use too much water. The dough is not soft. Do not over work the dough. Cover with plastic wrap and refrigerate for one hour (at least). Divide the dough into 40-45 balls, make karanjis as mentioned above. Once all the karanjis are ready, preheat oven at 375F. Line the baking sheet with parchment paper, arrange prepared karanjis and bake them for 15-20 minutes. Check after 12 minutes and decide the baking time. You can press the karanjis with fork if you do not have karanji cutter. You can also try 'murad' (twisted edge) as shown in the video shared above. You can use these dough recipe with any kind of filling mentioned above.